· Affordable Healthcare for all Employees: I surely don’t mean Obamacare; I mean healthcare for all. No exemptions and no exceptions. If an employer doesn’t have enough capital to pay into healthcare accounts, he doesn’t have enough to be in business and won’t be around long anyhow. Enough with the small business blues; down with Big Companies shirking their moral duty. · Mandatory Breaks: Ban the working lunch. Now! For blue, pink, and white collars. Workers need breaks and working lunches are just an excuse to squeeze blood from an already blanched turnip. Study after study shows that rested workers are more productive. Companies such as Google are even setting up nap-pods for short rest breaks. Some New Zealand employers require two 20-minute tea breaks and a lunch hour daily. They get more done that way. · Mandatory Vacations: Far too many employees yield their vacation rights out of fear of retaliation. This is immoral. Some refuse to take time off because they think they’re irreplaceable. They are fools headed for an early grave. The Big Bad Government should simply mandate that vacations must be taken and that employers must force the reluctant to take them. · Salaried Employees Bill of Rights: This is so overdue I’m shocked that no one’s talking about it. Wagner Act rights largely preclude salaried employees, many of whom routinely work 60-80 hour workweeks. That’s ridiculous. Employers should be required to adhere to their job descriptions, and these should be in line with Wagner Act guidelines. Private business is grinding salaried employees like cheap sausages. What a deal! Hire someone for a seemingly nice salary of, say, $50k per year and then make him or her do the job of two or three people. If the job can’t be done on the clock, hire more help. · Job Protection Act: Globalization has become an excuse to slash wages and line investor pockets. Pass a law that forbids employers from closing a profitable business and moving it to East Desperado so they can get even cheaper labor. They can choose to go out of business altogether, but they must offer that firm to an employees/new investor consortium at market value and cannot operate a competing business for 10 years. · Offshore Taxation Reform: There may be no bigger tax rip-off in all the land as the one that allows employers to move businesses offshore, take tax write-offs, and then import goods back into the USA while paying taxes in the host country. Time for some tariff reform. How about taxing the percentage of goods that U.S. firms make offshore and re-import? If Brand X boogies off to Botswana to make t-shirts, but sells 80% of those shirts in the USA, tax that 80%. And while we’re at it, end the loopholes that allow employers to write off relocation costs in the first place. · Usury Reform: By what perverse logic are banks allowed to charge working people 18% interest on credit cards, dun them for every banking service they use, but pay under 1% when workers actually save money (which banks use for investments)? How about a law that says lenders cannot charge more than three times what they pay in checking/savings/IRA account interest? Think that’s too low? What investment can you or I make that gives a 300% yield? · Pay and Windfall Profits Caps: CEOs make, on average, 273 times as much as their employees. Oil firms have suspended the rules of supply and demand in favor of what the market will bear. Insurance firms, hospitals, and colleges have upped rates many times above the official inflation rate. Enough! Since when did “piracy” and “reasonable profit” become synonyms? We need a percentage cap between top and bottom salaries, as well as on profits. Salary caps seem to work in most sports, so let's slap one on CEOs and investors. Anything above goes into a special social fund for infrastructure improvement. In essence, you can get rich, but not as rich as Croesus. · A Living Wage: Why is there even a debate over this? There is no economic, social, or moral justification for fulltime workers living in poverty. None. Mention “trickle-down economics” and go to hell. Do not pass Go. Do not collect $200,000. Can this happen? We could vote it in if we don’t let ourselves be distracted by BS social issues, or be swayed by fork-tongued demagogues. I don’t just mean Tea Party whack jobs. I don’t care if it’s a Republican or a Democrat–if that person isn’t talking about substantive ways to improve the lot of working people (not the Business Community, which is doing very well, thank you), then that person should not get our votes. We do have choices, whether it’s the Green Party on the left, or protectionist advocates on the right. (Think I’m kidding about the latter? Patrick Buchanan cares about workers more than most Democrats.) Let’s vote ourselves some bread and roses come November, and not be swayed by fakirs promising kind hearts and coronets. I’m not sure if this is a bad album I like more than I should, or a really good one I like less than is warranted. 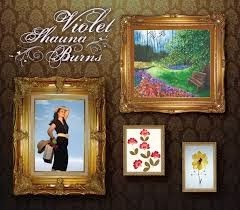 Las Vegas-based singer Shauna Burns is often cited as a “Celtic folk rock” singer, but the out-of-fashion label “New Age” suits her best. She places her soprano in a mix of piano, harp, cello, guitar, and percussion akin to Celtic chanteuses such as Loreena McKennitt and Connie Dover, but with the moodiness of Tori Amos and the atmosphere-over-lyrics ethos of Enya. The album’s 14 songs are originals and there’s nothing particularly Celtic, folk, or rock about any of them. The songs that work well–the fragile “Orchid” and the understated “See Her Again”–do so because they are less orchestrated pieces and ring with honest emotion rather than enveloping us in a studio-enhanced aura. The album’s strongest track, “Portobello,” enchants because James Clark’s hand drums add a jumpy counter to the rain-like piano notes.